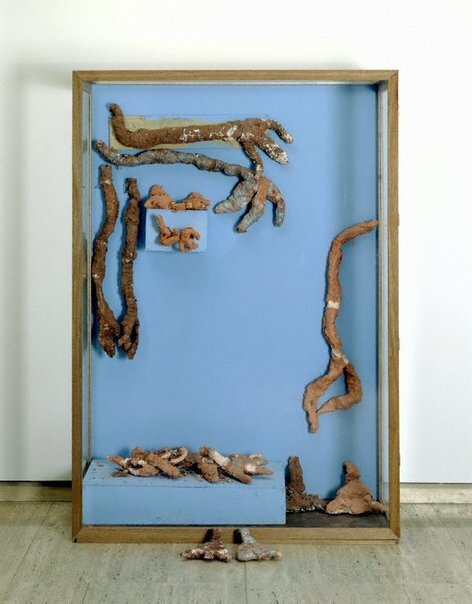 'Bird dis-play' takes the form of a humble and contingent museum display cabinet, containing and not quite containing the decayed and crumbling remains of badly made models of the feet and legs of birds. The feet in this cabinet, originally part of an outdoor installation Kathy Temin created for the Museum of Modern Art at Heide in Victoria, are modelled on different types of birds - emu, ostrich, duck, penguin, owl and pheasant - although it is doubtful if even an ornithologist could recognise the original bird. This deliberately abject version of a museum display parodies the collecting and preservation which constitutes the core role of museums. In splitting the word 'display' into 'dis-play', Temin emphasises both the dysfunctional nature of her object and by implication the museum practices it refers to: embodying the complexities of life in dead and preserved typologically correct exemplars. The title, however, also refers to the playful nature of her work, of the use of seemingly childlike forms and methods, as well as to a disturbed element in this play as art. Temin's soft sculptures and fragmented installations have their antecedents in the work of artists such as Claes Oldenburg and Eva Hesse. Her use of craft materials in many of her works - felt, fake fur, cord, modelling clay - and her deliberately unfinished presentation in which her art is often quite literally coming apart at the seams have been seen as both critical of and a homage to the more mutant forms of modernist abstraction and minimalism. However Temin has created her own visual vocabulary which is hesitant and non-committal and in which aberrant and uneasy moments are tinged with pathos and humour, in art as in life. Her works are often cute and appealing, yet their failure in being finished artworks or good examples of craft and their malformed appearance often give them a biting edge. In 'Bird dis-play' the dismembered birds' feet, crumbling clay spilling onto the floor and institutional pale blue colour of the cabinet all suggest that a misfortune of some magnitude has occurred in the museum, or at least in our ability to discern what a cultural exemplar now is. 'Troubled times' 1999 (AGNSW collection) is part of a series of works which won Temin the 1999 Moët & Chandon Art Fellowship. While the title suggests a broad political content, it refers to experiences of self and relationships with others. Constructed from grey and white felt, Temin's cartoonish characters are caught in a variety of moments. In one panel a cute but featureless figure sits up in bed and communicates with us by holding up a sign that says 'I don't know myself'. In another the figure photographs us looking at him, suggesting that we are implicated in this tale of misrepresenting our selves both publicly and privately. These cute figures call out for empathy, and yet in turn their laconic irony is quite chilling. The anxiety that permeates these works reflects our general anxiety about human relationships at this point in time and our increasing predisposition to talk about our private lives and experiences publicly while being increasingly unsure of what our public personas are. Naomi Cass, Art & Text (No. 50) , 'Kathy Temin', pg.64-65, Prahran, Jan 1995, 64-65, 64 (illus.). Deborah Edwards, Robert Klippel: large wood sculptures and collages , 'Robert Klippel - Large Wood Sculptures and Collages', pg. 7-35, Sydney, 1995, 32. Natalie King, Art and Australia (Vol. 32, No. 3) , 'Dis-played', pg.444, Sydney, Autumn 1995, 444 (illus.). Wayne Tunnicliffe, Contemporary: Art Gallery of New South Wales Contemporary Collection , 'Reality bytes', pg.382-423, Sydney, 2006, 420, 421 (colour illus.). Unknown, Unknown and Unknown, Kathy Temin , 2000, 40 (colour illus. ).